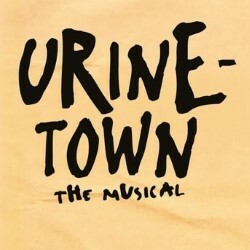 It’s great to see Urinetown back in Edinburgh, I’m surprised it isn’t on more often as it’s a perfect show for the diverse audiences of the Fringe. Once again the Royal Conservatoire of Scotland brings first-class production values to the festival in a full-length, fully staged production of this literal piss-take of a show. Ken Alexander’s direction is a joy to watch, particularly with his attention to detail and ability to bring all the humour to the fore. I loved the small things, such as the four clasped hands beating as a heart, it’s these touches which make the RCS productions stand out from many other shows at the Fringe. The cast are vocally impressive with excellent characters and whilst not exactly a dancing show there is a lot of choreography which is inventive and well executed with conviction. The set is one big piece but well designed and utilised and of course designed and built by students. Lighting is very effective. As expected, the live band is excellent too (with a fabulous reeds player) and although it took a few minutes to get used to the acoustics of the venue the whole show sounded excellent. Definitely a show to catch this year, if you love musicals you’ll like the references, if you don’t then you’ll love that it is irreverent and self-aware that it is just a musical farce. First class.